Mobile Rock Climbing is a sport which can be enjoyed by people of all ages. Sport England describes rock climbing as one of the greatest challenges of human strength, skill and endurance and one of the most rewarding sporting activities. We can provide a mobile rock climbing wall experience at your event whether it is an extreme sports event or a rock climbing taster session. The Mobile Rock Climbing Wall is an all ability wall, providing routes for both experienced rock climbers and those with little or no rock climbing experience. 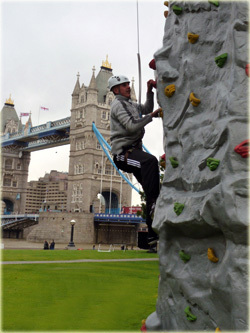 The Portable Rock Climbing Tower can be used by four rock climbers at one time. It uses hydraulic auto belays to safely control the descent of the climber and is an impressive 8m in height, so it is sure to pull in a crowd. We provide Mobile Rock Climbing walls for multiple activity days for any occasion, whether its a school activity day to achieve learning outside the classroom, a company trying to achieve a corporate team building day or an organisation wishing to use our activities to promote a product. 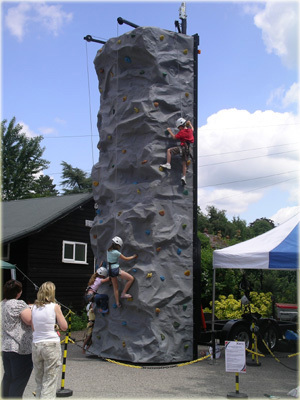 As well as our Mobile Rock Climbing Wall, we also have other activities and inflatables. 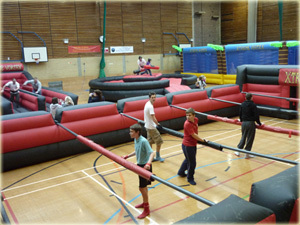 Why not test your accuracy our Inflatable Multi Sports Arena playing Beach Volleyball or Bouncy Basketball, or challenge your coordination and team building skills on the Human Table Football? Regularly maintained with safety testing that is relevant to each activity. Full Risk Assessment available for each activity. Why not look at our Testimonials page to see what others have said about previous events we have worked on.